Dodgers Blast Ahead Of Astros To Tie Up World Series : The Two-Way After a mostly scoreless game, the Los Angeles Dodgers blasted ahead of the Houston Astros in the top of the ninth inning with five runs, evening up the best-of-seven series Saturday, now 2-2. Joc Pederson of the Los Angeles Dodgers celebrates hitting a three-run home run in the ninth inning. The Los Angeles Dodgers evened the stakes Saturday night, outlasting the Houston Astros in a drawn-out rally that quickly escalated into a 6-2 victory in the final inning. 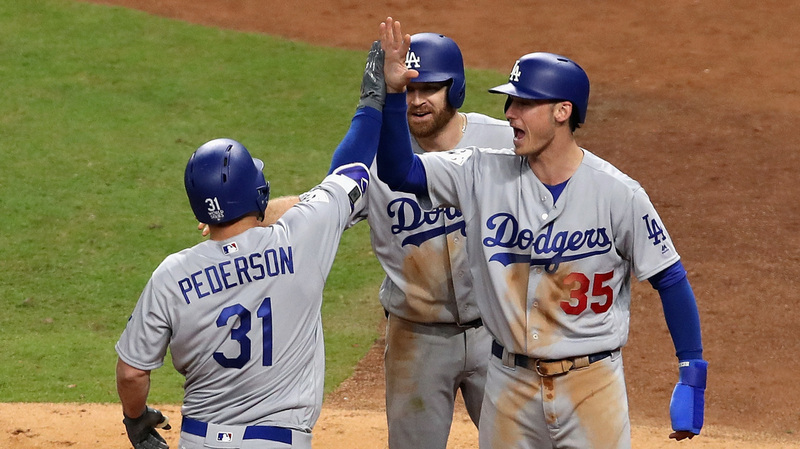 The Dodgers' Joc Pederson sealed the late comeback with a three-run homer off of Astros pitcher Joe Musgrove in the top of the ninth inning. Remarkably, Game 4 remained scoreless all the way through the fifth inning, as Alex Wood completed a historic outing as the first Dodgers pitcher to carry his team through five World Series innings without allowing a hit. Meanwhile, the Astros' Charlie Morton, who let in three hits, wasn't far behind the starting pitcher. But Astros' George Springer broke both the no-hit bid and the tie in the bottom of the sixth inning with a left-field homer. The Dodgers leveled the score in the seventh inning as Cody Bellinger scored off of a single from teammate Logan Forsythe. But it wasn't until the top of the ninth that the Dodgers blasted ahead with five runs. The Astros took one run in the bottom but it wasn't enough to recover. Chatter leading up to Game 4 focused on Astros' Yuli Gurriel who, just hours before Saturday's game, escaped a World Series suspension for making a racist gesture toward Dodgers' Yu Darvish in Game 3. MLB commissioner Rob Manfred did pull him out of a handful of games next season, but tonight, the first baseman received a standing ovation from a noticeable amount of Astros fans. Game 5 is scheduled for Sunday night in Houston.